Alan Chargin will be sharing stories behind how Capitol Hill small businesses got their start. 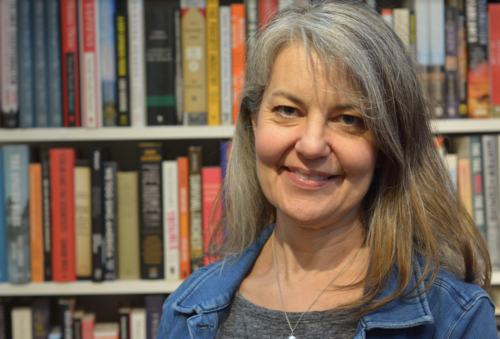 This week, he sat down with Laurie Gillman, owner of East City Bookshop at 645 Pennsylvania Avenue SE. The following conversation has been edited for clarity and brevity. Alan: How did you decide on opening a bookstore? Laurie: In early 2015, I decided I was ready for a career change and wanted to own my own business. Ever since Trover Shop Bookstore closed in 2009, there were no new book stores in Capitol Hill– or Eastern DC for that matter. I believed there was a strong desire and customer base just waiting us for to open, and many friends and neighbors who gave me feedback confirmed it. What first steps did you take once you were committed to moving forward? The first thing I thought to do was read some books! The American Booksellers Association has very helpful literature. They recommended a weeklong course on owning a bookstore, where I met many current and prospective bookstore owners. When I returned from the course, I wrote my business plan with help from SCORE DC and started looking for space. Most Capitol Hill landlords wanted restaurants, so eventually I found a space in Old Town, Alexandria. Before I could pull the trigger, I remembered that a strong sense of community was one of the biggest factors I sought in opening a business. I couldn’t resist circling back to Capitol Hill, got lucky finding our current home near Eastern Market and signed a 6-year lease! No major construction was required, but we put in all-new floors. The biggest challenge was getting all the bookcases and shelves installed and all of our inventory into the store! We started out with 11,000 volumes (almost 9,000 titles) and that was a huge undertaking. We’re up to 15,000 volumes now, and growing all the time! Any crazy stories to share from this time of starting out? A miscommunication caused all of our inventory to be delivered to the curb rather than inside as intended, so 300 boxes of books were left on Pennsylvania Avenue and I was the only one there. We have a great neighborhood: The staff and owner of Labyrinth rushed out and helped carry boxes. The new staff I had just hired also rushed over. I paid a couple of the guys who hang around the area to help out as well. We got all the books moved inside in just over an hour. That could’ve been a rocky start. Was it tough to obtain financing? I wasn’t able to get a business loan because I’d never owned or run a business, so I had to come up with other means of financing. I was able to get some loans from family and finance some of it myself. What sets East City Book Shop apart from your online competition? I think people look at bookstores as a community center, not just a ploy to buy things. That’s why we try to make community our main focus, with author talks, book clubs, musical acts, private events, etc. And believe it or not, more bookstores are currently opening than closing nationwide. Do you think your staff contributes to that as well? Absolutely. When we interview potential employees, we ask them all about what they like to read and what they’ve read recently. Our customers can be assured that whenever they visit us, they’ll be helped by someone who knows and loves books. We’ll also match our customers with different booksellers based on who best matches the genre or category they’re interested in. What key feedback have you received from your customers? Early on, we had a very broad spectrum of events on our calendar, but gradually we’ve been able to home in on what people really want. We’ve also expanded our book club offerings as people have made different requests and suggestions. What we appreciate the most is how often our customers thank us for being here for them, when we’re the ones who are thankful to them for supporting us with their business! Do you own the business with anyone else? [I own it with] my partner Cathy Landry, who joined me in October 2017. She worked for us as a bookseller and eventually left us to join the Library of Congress. I knew I needed some help, but our structure wasn’t quite ready yet to support hiring a manager, so I approached Cathy. To my pleasant surprise, she was in! We complement each other very well in sharing responsibilities: I handle most of the marketing and community outreach and Cathy is more behind-the-scenes with inventory and systems. Reaching profitability is an obvious one. I’ve been surprised by the amount of investment required to really build out our back office and inventory management. Increasing our purchase quantities gets us better pricing so we want to continue building that up. With DC being such a transient place, we’re constantly working to get the word out about all of our great book clubs and events and such. Lastly, we want to continue supporting our community whenever we can, so we’re aiming for an even bigger holiday book drive this year than we’ve had before! What advice would you give to prospective business owners? I’d say two things, slightly contradictory. Both are important! First, be objective: Don’t convince yourself of what you hope will be true or will work. Make sure your plan is solid, set guidelines for yourself, and be able to let it go if it truly won’t work. At the opposite end of that, don’t be too cautious. At some point you just have to take the leap. You can’t learn and prepare for every aspect before just doing it. We’ll finish with some rapid fire questions about you. Favorite kids’ book? Book that first got you hooked on reading? That’s so tough! I’d say Toni Morrison. She has so much intricate content, you can reread her over and over and get something new every time. Thank you, Laurie. Any closing thoughts? We’ve got a great customer loyalty program: $5 back for every $100 you spend. Also be sure to check out our many book clubs as they’re a great way to meet new people and dive deeper into all types of literature. Lastly, we do have more than just books: please check out all of our SWAG and other fun gifts! Follow East City Book Shop on Facebook, Twitter and Instagram. Their website has a list of their book club offerings as well as a full events calendar! Comments? Suggestions? Leave me a comment or email me at alan.chargin@gmail.com.